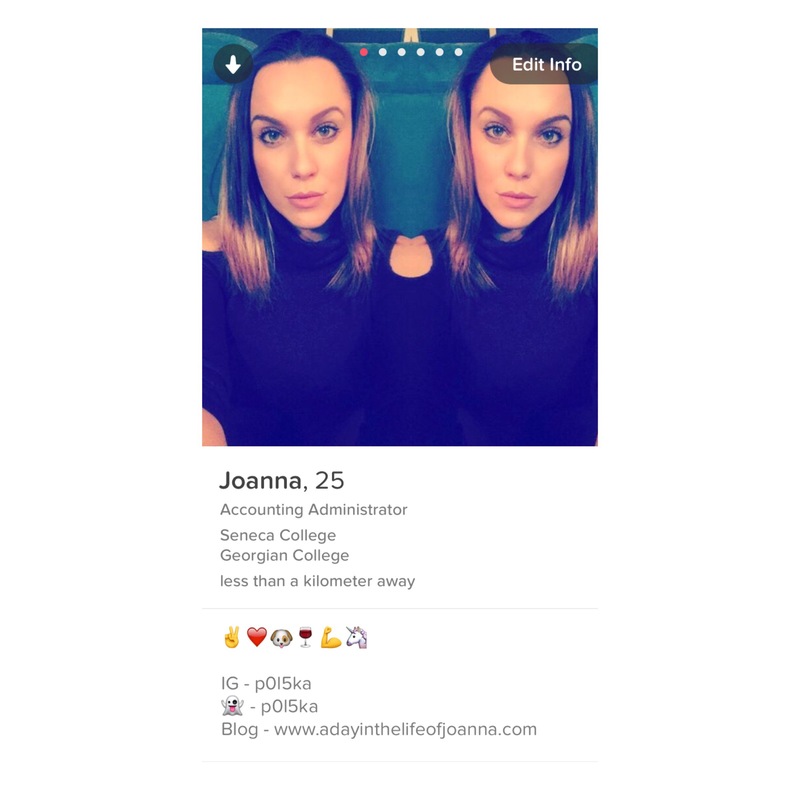 ﻿Tinder Experiment | A Day in the Life of Joanna. This all started Friday December 9th at 7pm. I made my profile. I put up some pics. I wrote a description. I made my maximum distance 50km from Georgina, and age range 25-32. I then started swiping. My goal was to swipe 2000 people in 48 hours. I sat there and contemplated whether I should deal with the fact I can only swipe right 120 times in 12 hours, or accept I am going to spend $13.99 on Tinder Plus. I decided to splurge and spend $13.99… after all $13.99 is pretty much the same price as a decent bottle of wine. Once I purchased Tinder Plus, that’s when it got fun. The first night I swiped right to 800 people. When I woke up at 7am (12 hours into the Tinder Experiment) the next morning I had 357 matches, after swiping right to 800 people which is 44%. After 24 hours into this Tinder Experiment I had 689 matches, after swiping right to 1200 people which is 57%. Sunday morning I thought it was time to swipe right a bit more. I swiped right to another 800 people. Sunday night, 48 hours into the Tinder Experiment I had 1100 matches after swiping right to 2000 people which is 55%. Monday morning at 7am which is 60 hours into the Tinder Experiment, I had 1247 matches after swiping right to 2000 people which is 62%. Out of those 1247 matches, 600 of them messaged me first. 153 people used my name in their first message. 12 people Super Liked me. I started going through my matches and copying and pasting the same sentence over and over again. I asked about 600 people and 304 responded. 120 people gave me their number. 102 people responded with some generic response. 17 people asked me for my number. 63 people asked me a question or responded with another pickup line. I am now going to delete my account and make a new one (why not, I still haven’t found prince charming)… and never do this experiment again. Social Media.. What’s it Really Doing For Us? ← Top 10 Songs to Listen to After a Break Up. I figured when you unmatched me right away after I had given up my number it was going to be for something like this. Kudos to you for taking the time to conduct this experiment and providing the results for us to see.